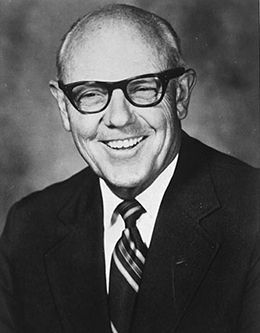 President Joseph Fielding Smith is presented an award commemorating his work and vision for family history and genealogy. To mark the occasion, he speaks about the central role of the sealing power in our quest for salvation. The text for this speech is unavailable. Please see our FAQ page for more information. Know that you have leaders of distinction here at BYU and that the Church invests its money and talent so heavily in this school because you are worth it. The text for this speech is unavailable. Please see our FAQ page for more information. When we return to meet our Heavenly Father, we want it to be a profitable homecoming. We can prepare now by living in accordance with the gospel. The text for this speech is unavailable. Please see our FAQ page for more information. A testimony of the gospel is essential for your eternal welfare. It is the most important type of knowledge to pursue, and as with all knowledge, requires diligence and humility. The text for this speech is unavailable. Please see our FAQ page for more information. Why Dress and Grooming Standards? We live in a troubled world, but the gospel has solutions to both temporal and spiritual problems—if we are humble enough to accept them. The text for this speech is unavailable. Please see our FAQ page for more information. Pioneers early and modern have made immense sacrifices for their testimony of the gospel. They know that if it is true, little else really matters. The text for this speech is unavailable. Please see our FAQ page for more information.